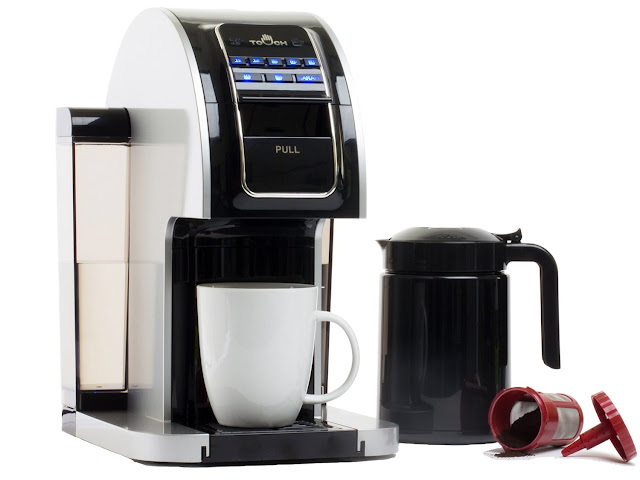 You can win this Touch Coffee brewer that come with a carafe and refillable Kcup! This prize package aslo includes samples of LA Coffee Kcups which are awesome, I absolutely love this brewer. I can make a single cup or a whole carafe. I can also save money by using my own coffee with the refillable Kcup. Enter via Rafflecopter below. Winner will have 48 hours to respond to email or forfeit prize. Reviewz & Newz is not responsible for shipment of prizes. My favorite feature of this awesome coffee machine is that it 90 oz. water reservoir. I love that the Touch Brewer is compatible with old and new K-cups. I like that it's ready to brew within 20 seconds. I'm an on-the-go kinda guy. I really like that it Heats coffee to 200°F. I love my coffee really hot. I like the jumbo refill. I love that you can pick the cup size. I like that it's very quick. My favorite feature is that it is ready to brew within 20 seconds. I love that it is compatible with all sorts of kcup brand, I also love that it is ready to brew in 20 seconds. This is great for those gotta go now times. My favorite feature is that it is compatible with ANY K-cups, some brewers are not and that causes confusion and problems that should not happen. I love that it is compatible with old and new K-Cups. I like that it has adjustable cup sizes from 6 to 26 oz. I like that it has a 90 oz. water reservoir. I love that it's ready in 20 secs! Super fast! Also adjustable cup size & different kcup sizes! Plus 200 DEGREE coffee! Very nice! I like that it is ready to brew so quickly. The best part is the refillable KCup. I like the Single Serve Brewer T526S because it has a jumbo refill and both my husband and my step dad are big coffee drinkers this would be great for them. I like that it is Ready to brew within 20 seconds. I like that it Heats coffee to 200°F! I love the adjustable cup sizes!! Somedays you want a small coffee, and other days when you are dragging...you want a huge cup! haha God bless everyone! I like that it has rapid brewing technology. I like that it's ready to brew within 20 seconds. I love the cup sizes from 6 to 26 ounces. Also great is that it uses any K-cup. i like Ready to brew within 20 seconds thank..i want one baby! I like that it customizes strength to your taste. I like that it's ready to brew in 20 seconds, no waiting. I love that its compatible with any kind of k-cups. My favorite is the ready to brew within 20 seconds feature. There are a lot of great features but my favorite is: Adjustable cup sizes from 6 to 26 oz. I love that it has a customizable brew strength. I love a good strong cup of coffee in the morning! I like the adjustable cup sizes from 6 to 26 oz. I think it's great that it has adjustable cup sizes. Those XL cups look fantastic. I love drinking black coffee, and I wish that the coffee machines at work gave a larger serving. I always have to make two! I love that it has changeable cup sizes and also that it brews good, strong coffee! I like that it is one touch and that it takes Kcups. I enjoy my coffee hot, black and lots of it. I love that it is ready to brew in 20 seconds. That is important because I m always in a hurry in the morning. The 20 seconds to brew is super quick I really like that. I don't like to wait too long for my morning fix. I like that it has adjustable cup sizes (from 6 to 26 oz.) I like switching my mug sizes up from time to time. My favorite features are that it's ready to brew in 20 seconds and that it heats up the coffee up to 200 degrees! My favorite is 90 oz. water reservoir. I like that it's ready to brew in 20 seconds. Makes coffee before work much more efficient. My favorite feature is the adjustable cup size. My favorite feature is that you can choose the strength. I like my coffee mild and my husband likes his strong. Ready to brew within 20 seconds!!!! Now that's a machine I can work with!!! I love that it is ready to brew in 20 seconds. My favorite feature is that it is compatible with all old and new K-Cup® packs plus our XBold and XLarge Cups. I like that the coffee brews in 20 seconds and that you can use kcups in this machine. I LOVE that's ready to brew in 20 seconds. When I need my coffee, every moment counts! I like that it's ready to brew in 20 seconds! I like that it brews at 90 degrees. My favorite feature is that it is "compatible with all old and new K-Cup® packs plus our XBold and XLarge cups". I like that it's ready to brew in 20 seconds and I can change different sized cups. I love that it uses any brand of K-Cup® packs and compatible with other cups. My favorite feature is the refillable KCup. I love how big the water reservoir is! I hate refilling that thing so often on mine! My favorite feature is the 90 oz. water reservoir. I like that it has adjustable cup size feature. I love that it is compatible with K cups. I love that it heats to 200 plus degrees. Who doesn't like a good hot cup of coffee. I love the big water reservoir so I'm not filling it up every day. But I also like how fast it brews! Sometimes I need that morning cup in just a minute! I really like the adjustable cup size! I like that it can brew just a cup or a whole pot. I love the adjustable cup sizes so you can fill a jumbo mug as well as a small cup. One of the many things I like is the adjustable cup sizes from 6 to 26 oz. I love that is compatible with all K cups. I have a huge assortment and this would be awesome. I like that it is ready to go in 20 seconds. I like the fact that it has adjustable cup sizes. I like that it Ready to brew within 20 seconds. The adjustable cup feature is something that is important to me in our household. I love that it consumes less energy per year than my current brand plus the bigger reservoir. Perfect for our large family! My favorite feature is that it is ready to brew within twenty seconds! My favorite feature is the rapid brew technology. I really like that it has Adjustable cup sizes from 6 to 26 oz. Thanks. My favorite feature is that it is really fast (like 20seconds fast) to be ready to brew. I love that you can use all k cups and it has such a large water tank. I like that it has a refillable Kcup so you save money. My favorite features are that it's quick and you can use the old as well as the new K-cups. I like that the Touch brewers are ready to brew in 20 seconds. Right now I have a whole coffee making process going on that takes way too long. The refillable cup is the most important to avoid adding to landfill problems with the pods that get one use. I like that is ready to brew within 20 seconds. My coffee pot takes forever it seems. I like that you can use any brand of k cup and that the cup sizes can be varied. I like that it heats coffee to 200°F. I like that it brews bigger and stronger coffee! I like the fact that it is done in 20 seconds. Caffeine is so important. I like the huge 90 oz. reservoir. I like that you can use varied coffee cup sizes. you can brew single cup or a carafe. good for any morning, one for the go and one for the days you get to stay at home. Compatible with both old & new K-cups. I love the adjustable cup sz. I love the quick brew feature & that it's compatible with old and new k-cup packs. I love the 90oz. Water reservoir. That's a lot of water! I love that you can brew between 6 oz and 26 oz. It would make life a lot easier. Thanks for the chance to win! I like that it is Compatible with all old and new K-Cup® and 90 oz reservoir. My favorite feature is that you can make a wide range of amounts.